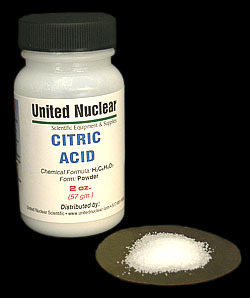 Citric Acid is frequently used as a buffer to control the PH in a variety of chemical mixtures. It also has the ability to chelate (lock on to) metals in solution. The tart taste found in some fruits is caused by Citric Acid. It can be used to make other Citrates, such as Ferric Ammonium Citrate, which is used in Blueprint paper.